[7-Day Digital Outlet Timer with 3 Grounded Outlets] The Fosmon outlet timer controls three grounded outlets simultaneously with a 7 day programmable timer. You are able to set 8 programs, and each program can be a set of on and off times for certain days of the week. The timer lets you customize your outlets exactly the way you want. [Photocell and 2hr/8hr Countdown Functions] This multifunctional timer switch can also become a dusk-to-dawn switch, or a 2 hour/8 hour countdown outlet timer. All functions are set to run by one press of a button. [Savings, Security, Safety] The Fosmon outlet timer benefits you through savings, security, and safety. The outlet timer always turns your appliances on or off on time and saves energy, saving you money. The random function increases your home security when you are on vacation. The outlet timer is certified with UL60730-1 for your safety. [Durable, Heavy Duty Construction] The PPE+PS material is rugged and resistant to harsh weather conditions. It is perfect for use both indoors and outdoors. With its 1/2 HP capacity, SJTW 14-3 grounded cord, and 15 amp rating, the outdoor timer even allows you to use it with heavy duty items like engine block heaters, pool pumps, pond aerators, and more. 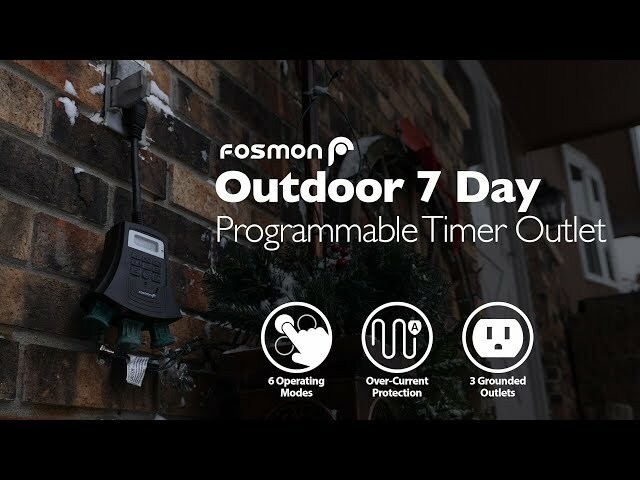 The Fosmon outlet timer lets you program 8 set of on/off programs, and each program can repeat every day or certain days of the week. Use this timer switch to automate your outdoor appliances, such as pool pumps or fountains, all year round. If you want to use this outlet timer as a dusk-to-dawn light switch, simply switch to “photocell” mode. The automatic light switch will turn the light on at sunset and off at sunrise. It’s perfect for holiday decorations and garden/landscape string lights. The outlet timer comes with a random function that can increase your home security. You can have it turn on the light inside or outside the house randomly to deter intruders, giving you peace of mind when you are on vacation. The Fosmon timer is built with durable, weather resistant materials, offering protection from rain, snow, ice, moisture, and humidity. With its 1875W and ½ HP capacity, the timer can be used for heavy-duty items like engine block heaters or pond aerators. The outlet timer is UL60730-1 certified.